With another quarter of strong investment returns in the rear-view mirror, investors now have their sights on early November. In the first week, we’ll learn whether the Federal Open Market Committee (FOMC), the group responsible for establishing interest rate targets, will increase interest rates. Then, on November 8, U.S. citizens will cast their votes in the 2016 presidential election. For better or worse, investors will have much more clarity around politics and interest rate policy by the end of the year. Given this investment backdrop, how should you position your portfolio for these events? Should you sell bonds because interest rates are likely to rise? Should you buy stocks because your candidate is favored to win? Or, as we quipped in “How to Invest for the 2016 Presidential Election,” should we buy Canadian real estate because half of the U.S. population intends to move north in 2017? Despite (or perhaps, because of) the utter unpredictability of world events and financial markets, adhering to a sound long-term investment plan has repeatedly proven to be the best course of action. On December 14, 2008, the FOMC cut the federal-funds rate to a range of 0.00% to 0.25% where it remained for seven years. 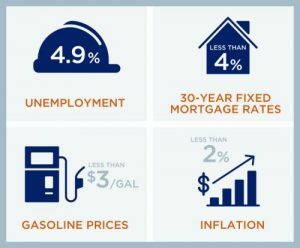 Even today, the interest rate is a modest 0.50%. Following the most recent FOMC meeting, Federal Reserve Chair Janet Yellen reiterated her position that while there is no fixed timetable for raising interest rates, she believes a strong case remains for raising interest rates by the end of this year. The shorter-term focus of the high-quality, globally-diversified holdings reduces sensitivity to rising interest rates. If the Fed stands by its message of measured interest rate hikes, the resulting long-term increase in bond yields will ultimately offset any near-term price declines. Another fallout from the Great Recession is the American political landscape. Despite substantial economic and market progress, the mood of the public remains distrustful. The upcoming election has unfolded amid intense political polarization, further increasing voter frustration. Winston Churchill famously said, “Democracy is the worst form of government, except for all the others.” Fortunately, the Founding Fathers created a political system with checks and balances by dividing powers between the executive, legislative and judicial branches. In recent history, Americans seem to prefer a balance of powers with different parties controlling Congress and the White House. In this way, Congress has proven to be a useful buffer between the president’s aspirations and the impact to the U.S. economy. Coming off the heels of the first presidential debate, we expect the government will remain divided in the years immediately following the election. It seems likely that the GOP will retain control of the House, and we don’t expect it will work harmoniously with whomever wins the presidential election. 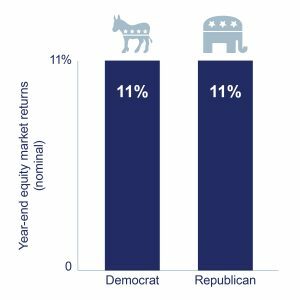 Perhaps surprisingly, a long view of history shows that the party in office is not consequential to market returns, as illustrated in Figure 2. Since the end of World War II, the U.S. stock market (as measured by the S&P 500 Index) generated positive returns during the terms of each U.S. president except Richard Nixon and George W. Bush. Including the entire eight years of Presidents Nixon and Ford, the stock market eked out a minimal gain. President Bush entered office in 2001 as the dot.com bubble was bursting and left office with the 2008 financial crisis. Whether the magnitude of change is small or large, portfolio adjustments based on political developments equate to market timing and rarely lead to success. We’ve experienced multiple volatile events this year, including the immediate aftermath of the U.K.’s Brexit election. If investors sold stocks after the vote, they would have not only missed out on the full recovery, they would have also missed out on the subsequent returns that followed. As of September 30, the S&P 500 Index is about 8.5% higher than its close the day of the Brexit announcement. Our job is to keep our clients’ emotions from affecting their investment portfolios. In the final months of this year, we expect this will become increasingly challenging as the political rhetoric and media hype continue to permeate our lives. This is simply another example of a period in time that will separate great investors from average investors. We want you to know that we are here for you: please don’t hesitate to give us a call if you find yourself concerned or overwhelmed amid all of the noise.